Fizik has gone with the whole 'less is more' ethos with its Arione 00 Versus Evo saddle. Stripped back to a mere 167g with minimal padding and lashings of carbon fibre, it is still surprisingly comfortable with a great balance of stiffness and flex. You're going to have to pay for such performance, though. Fizik's '00' range is its showcase of what is achievable in terms of design with top end materials. The Arione 00 Versus Evo has a shell made from high modulus carbon fibre which is unbelievably stiff considering how thin it is, with the central channel literally just about a millimetre thick. Even the main sections either side of the channel are just 4mm thick too. Though the whole shell feels stiff, it does a decent job of allowing just enough flex to take out any harshness or road vibration. This is helped by the Mobius carbon fibre rail. Rather than having two rails plugged into the front and rear of the saddle, the Arione 00 uses a single rail which makes up a complete loop around the base of the saddle. It adds stiffness front and rear but allows the shell to flex around the sides, so the saddle can move with you a little as you pedal. It looks cool but does make the fitting of some saddle bags a bit of a faff. For pressure relief, most saddles use a cutout in the middle but Fizik has gone for a different approach with the Versus Evo models; there is an Arione Open model, if that's what you are after. The Versus Evo has two sections of padding either side of the central channel. They are firm and did take a little bit of breaking in over the first hundred miles or so. When softened up, the padding offers plenty of comfort while the edges next to the channel maintain their firmness and shape to stop sagging and maintain that pressure relief. When it comes to saddle shape, Fizik designs its range around the Spine Concept, which takes spine flexibility and pelvic rotation into account. They are split into three categories: Snake for the most flexible of riders, then Chameleon, then Bull. 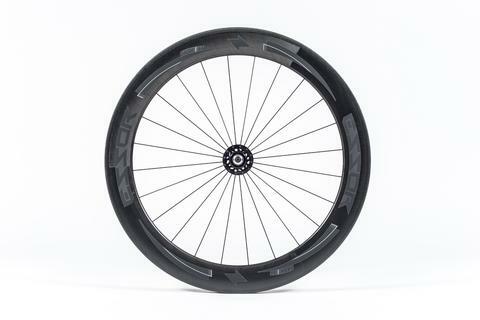 The Arione is part of the Snake range with its flat profile, and is ideally suited to hard and fast riding especially in a flat backed racing position. Three to four-hour rides were carried out in plenty of comfort on my own race bike, and I really enjoyed the balance of plenty of stiffness under heavy pedalling efforts and shock absorbance when the road surface was far from ideal. The Arione's 299mm length gives you plenty of area to shift your body weight around on; for instance, when climbing I like to push myself further back to the rear of the saddle as I am more efficient. At £324, it's one hell of a lot of money for a saddle, but for high-end products like these, value for money is very rarely high on the list of reasons to buy. A similarly constructed carbon fibre saddle (albeit with some modularity) is the Repente Aleena 40, which costs £295. Or there's Rapha's Pro Team Saddle at £295; you get a full-carbon shell and rails, although I don't think it has quite the aesthetics of the Arione. If you wanted the Versus Evo design of the Arione but without the 00 price tag, the standard version costs £189.99 (we tested the Antares version here); you only get a carbon-reinforced shell and standard carbon rails, but it is only about 20g heavier. On the whole, the Arione 00 Versus Evo is one of the best race saddles I've ridden. If you're happy to shell out the extra over the non-00 version you won't be disappointed; I'm not sure I could justify it. Fizik says, "Arione Versus Evo 00 is a full carbon performance racing saddle that delivers stiffness and light weight in a full channel design. Spine flexibility and pelvic rotation are inextricably linked to saddle comfort. The Spine Concept Evo fitting system helps determine which of the different Fizik saddle shapes fits you best. Arione is a flat profile saddle designed for Snakes, riders with high body flexibility and no pelvic rotation whilst pedalling." I found the shape and padding of the Arione spot on for performance road riding. Pretty good but there are lighter. When it comes to riding hard and fast in a race position you can't really fault the Arione for comfort. There are a few other saddles on the market at the £300 mark with a similar construction. Saddles like the Rapha Pro Team are lighter too. Would you consider buying the product? I probably couldn't justify the huge outlay over the non 00 models. Excellent comfort for such a minimalistic saddle, but its massive price will be a sticking point for most. I really wish the road.cc staff got paid for what they do - every item that has even the slightest bit of quality is always written about as if it is too costly. Apparently the writers feel the highest quality should come at Aldi prices. As someone for whom cost is no object, it's tiresome to read time after time. Respectfully, there aren't many people in your position, as fortunate as you are. Value has to come into a review, otherwise most top end products would get 4-5 stars and most lower priced products would be rated lower. Unfortunately, in the current market, especially when you can get basically the same saddle (albeit at a slightly higher weight) for a much cheaper price in the R3 and R1 versions, the 00 models are a niche product for only those who must have the lightest. There are other websites out there who choose not to operate in the real world and don't consider price when it comes to reviewing items, go read them instead. I'm happy that road.cc consider value for money as it's a big factor for myself and 99% of it's readership. Often the greatest innovation comes from having to work to real world constraints, not from just endlessly throwing money at R+D. To be fair, a product review should be based on the 'how well does it do what it promises to do' approach. And only then should the reviewer add (but not judge on) the price component to leave readers to do the judging. When written by a professional, the first part of the review can fairly be expected to be objective. The second part should avoid any hint of subjectivity. This adds no more value to a conversation than a forum-poster chipping in that he wouldn't pay that much for whatever it is. Part of my life involves driving and testing some rather gorgeous automobiles. I don't judge on price - because I'm not the target for manufacturers on £300,000 cars. But I know plenty of my readers are.